Champion of the Trakehner Approvals of a supreme athletic type. Noble blood of its most fascinating appearance: Powerful gaits, excellent hindquarters, an impressive walk and a hard to find temperament completes the picture. Grand Passion’s breeding is aimed at producing a great willingness to perform. 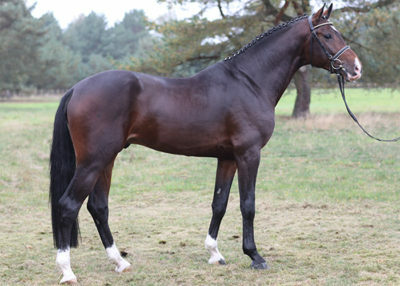 His dam Gipsy Rose is a full sister to the national and world champion of young event horses, Grafenstolz, who is constantly victorious in the international eventing scene. He competes up to three star level and his progeny have successfully mastered their first cross country round at the young horse national championships. 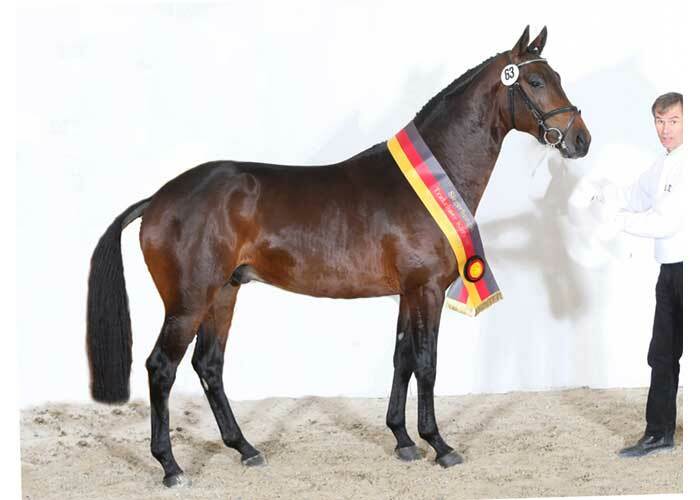 Grand Passion’s dam was awarded the title ‘best three year old’ in Rhineland and was reserve national champion 2000. 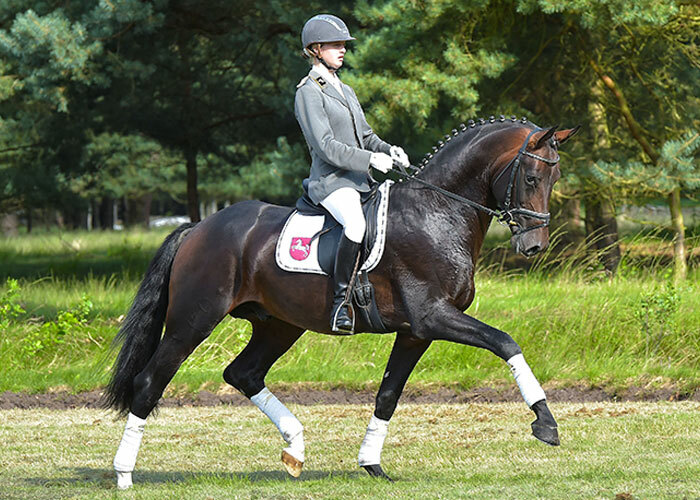 Her sire Polarion was successful at Grand Prix level and competed in world cup qualifiers with Markus Gribbe as well as the European Junior Dressage Championships with Laura Bechtolsheimer. Grand Passion descends from the highly successful Trakehner mare line of the Gundula/Poll-Horem, amongst whose progeny is the state owned stallion Gipsy King. His great grand dam Grazie was announced the top mare on more than one account and twice took part in the national young horse championships. Grand Passion’s sire Oliver Twist passed his stallion performance test with flying colours. His genes are those of high performers: licensing champion Monteverdi made it to the finals of the national championships and his competition record includes wins at Grand Prix level. 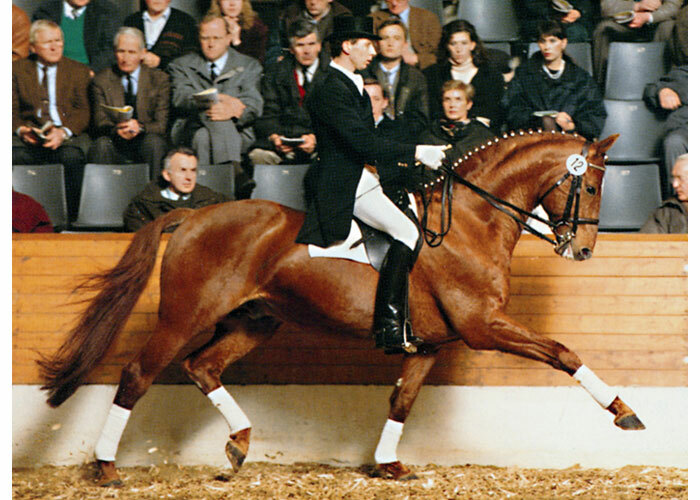 Monteverdi’s sire Partout was internationally triumphant with Anky van Grunsven. With Grand Passion we offer our breeders the most sought after stallion of the Trakehner stallion approvals 2007, which is an athletic and noble stallion with gaits of astonishing excellence. Approved Oldenburg, Trakehner, Rhineland, Westfalen.